We’re deeply honored to experience Cambodia alongside a woman whose passion for this country and its culture – the ancient traditions and emerging sophistication – is as inspired as it is inspiring. Deana’s grandfather, Saukam Khoy, was the last president of Cambodia before the country fell to the Khmer Rouge in 1975. Fortunate to escape the genocide that killed millions of Cambodians, her parents fled and settled in Houston, Texas, where Deana grew up. 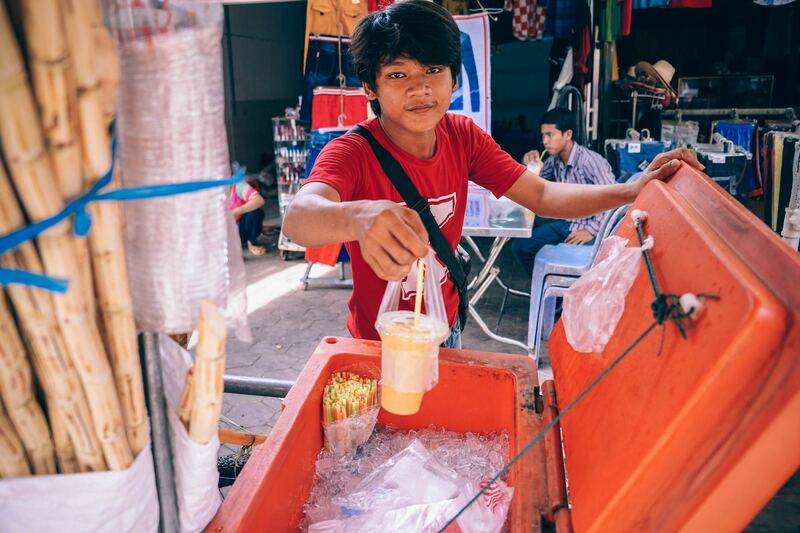 Though her parents didn’t often talk about the country they left behind, they did keep Deana connected to Cambodia through language, culture, religion and – perhaps most critically – through food. An adventurer through and through, Deana isn’t afraid to dive in and experience the places she visits on a more personal level, shirking the idea of ‘traditional’ tourist traps in favor of more authentic encounters. Deana’s passions are food and travel. And photography. And art. And fashion. She’s bilingual in English and Khmer. Home is Austin, Texas, and she’s on the road frequently in Europe and Asia, hunting through street-cart vendors and markets in search of treasure. She’s forever wanting to share her knowledge. Just like your very first childhood friend, she’s the kind of woman that’ll split her own cookie with you just to show you what it tastes like. She’s also working on a Cambodian cookbook. We’re salivating over the possibility of preparing our own comforting curries and noodle soups from her recipes. Take just one look at Deana’s Instagram to see why she’s our favorite cross-cultural ambassador and possibly the most qualified human on Planet Earth to lead us on a discovery of true Cambodia. True Cambodia with Deana Saukam. The temples of Angkor, Siem Reap’s food scene, Phnom Penh’s nightlife, the unhurried rhythm of Kep and coastal Cambodia. 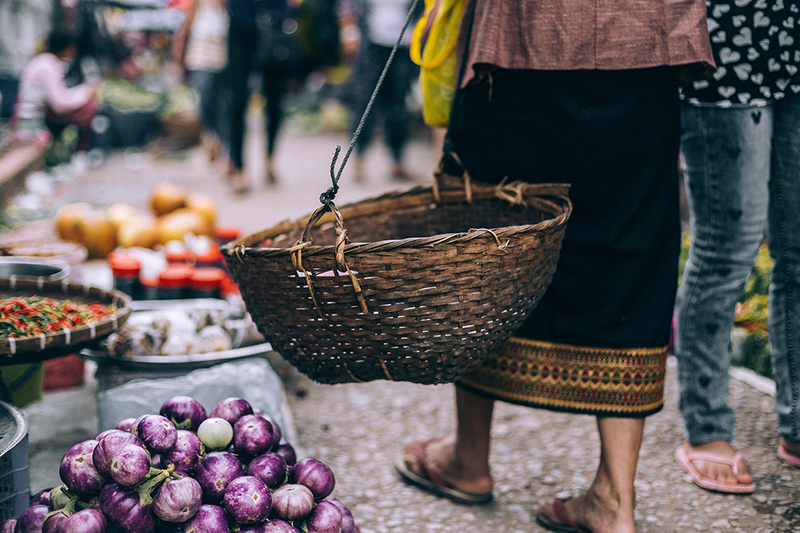 We start at our hotel in the heart of Siem Reap, and kick off the trip with a food-lover’s introduction to Cambodia at the city’s colorful, chaotic outdoor market. In the afternoon we visit the famous temples of Angkor, a vast and majestic empire of ruined roads, canals and small lakes. Angkor Wat itself is arguably the world’s most famous temple ruin. We’ll explore in late-afternoon light, finishing up with a cold coconut juice and the joyful experience of sunset over the temple. 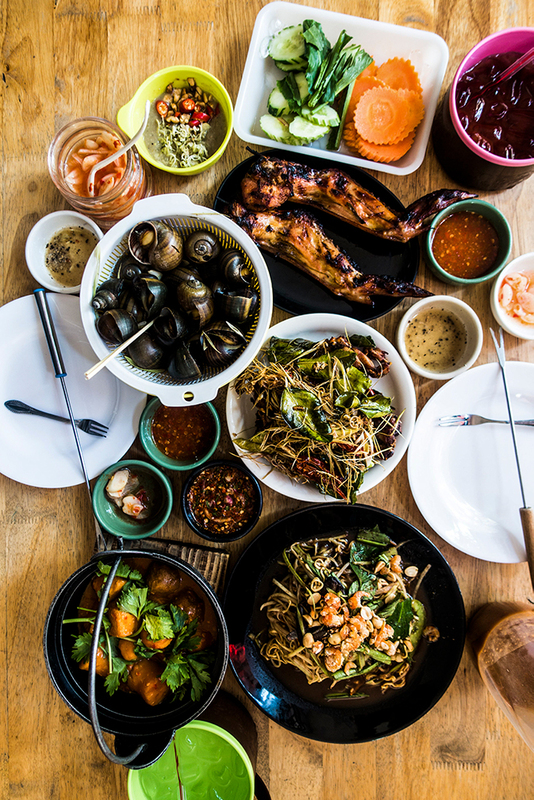 Deana will take us on a short walk through a local night market – this is your chance to sample fried or stuffed frog, or maybe fried crickets – before dinner at one of Siem Reap’s finest modern restaurants, headed by Cambodia’s only master chef in a tranquil outdoor setting. We’ll travel into the countryside by tuk tuk for a hands-on cooking class hosted by chef Mork Mengly, one of Cambodia’s rising culinary stars and famous for transforming humble ‘countryside food’ into haute cuisine. After lunch we visit a local pagoda to experience a traditional water blessing led by Buddhist monks. Then it’s off to Phare Ponleu Selpak (Khmer Modern Circus), originally set up in refugee camps to help displaced Cambodian express themselves through art. The non-profit has earned numerous awards for its work and mission. We’ll catch a late afternoon performance before returning to our hotel with the evening to explore on our own, with a thoughtful list of dining recommendations to guide us. Sunrise at Angkor. 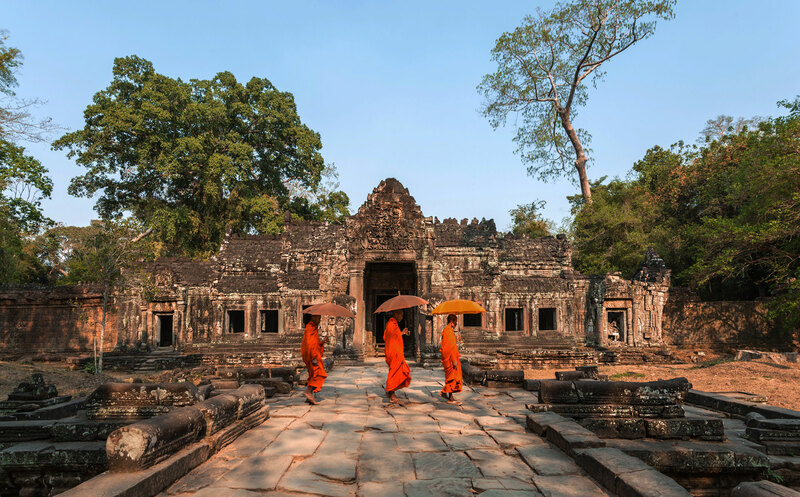 We rise early, cruise through the still pre-dawn streets of Siem Reap, and climb the steep steps of Pre Rup temple as the morning mist is pierced by the sun rising gracefully above Angkor’s rice fields and temples. We’ll slurp a traditional Khmer breakfast of green curry noodles with fresh greens at a local village, then head to the jungle-clad ruins of Ta Prohm, one of Angkor’s most photogenic temples, and the Bayon Temple, at the center of the ancient city. The afternoon is yours to relax, enjoy the hotel pool and spa, or explore Siem Reap. We’ll reconvene in the evening for a pre-dinner aperitif of infused rice wine in a traditional stilt home. Dinner is at Chef Somontha Oeng’s award-winning restaurant, Khmer Touch, easily one of Siem Reap’s top dining spots. 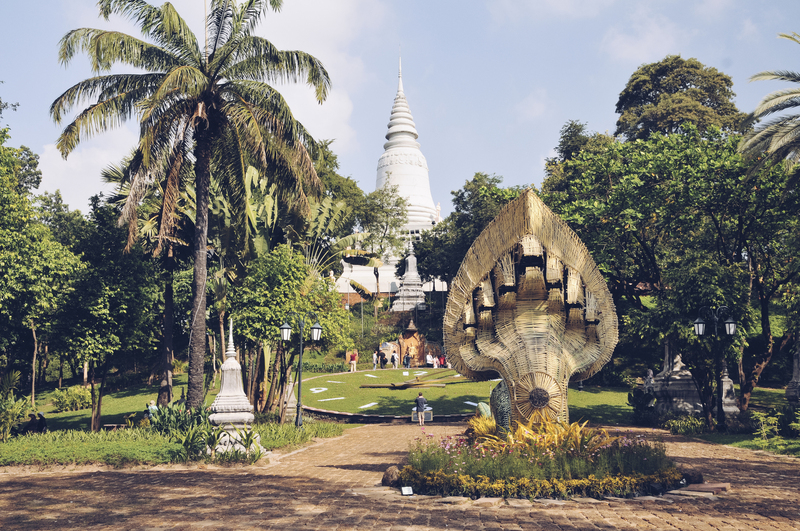 We leave Siem Reap and head to Phnom Penh, Cambodia’s capital, with a stop en route for lunch. Dinner is a truly unique experience – a five-course meal at Mahope hosted by Chef Nak. Mahope is a private home and a masterpiece of traditional design set next to the Mekong River. Chef Nak is the star of the show. He’ll personally serve our sumptuous meal highlighting ancient Khmer cooking styles, highlighting his personal connection with each course in detail. A performance by traditional Khmer musicians serve as a backdrop for this unforgettable meal. The amazing city of Phnom Penh is at once highly provincial, deeply cosmopolitan, full of life, vibrant, noisy and utterly mesmerizing. We start on a cyclo (a three-wheeled pedal rickshaw) for a tour of the city’s icons: Phsar Thmei, the chaotic central market and arguably one of the most distinct, and stunning art deco buildings in Cambodia, if not Asia; Wat Phnom, the city’s namesake temple; and the Royal Palace. We’ll kick off the evening with a rooftop cocktail. The theme for tonight is street food and nightlife, starting with a guided drive through Phnom Penh on the back of a Vespa scooter. We’ll explore the city and stop for some of the tastiest street food: fresh oysters, Basa fish, and definitely squid with kampot peppers. Phnom Penh’s nightlife – live music, dance clubs, upscale cocktail bars – is second to none in southeast Asia. We’ll explore it all and celebrate our time together. We leave Phnom Penh behind and first to Kampot for lunch at its iconic fish market, an art deco masterpiece built right over the water. The fully restored venue is now a trendy lunch spot with breezy river views. Our ultimate destination is Kep, a seaside town and former French colonial outpost. 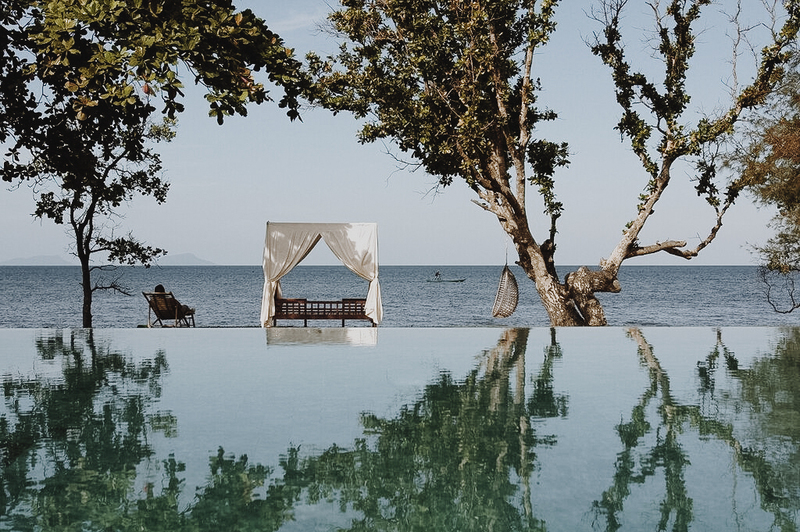 Though its elegant mansions are long gone, a victim of the Khmer Rouge era, Kep has been revitalized. A small local beach, a thriving fishing port, a stunning resort, and an easily accessible national park make it the ideal base for exploring coastal Cambodia. 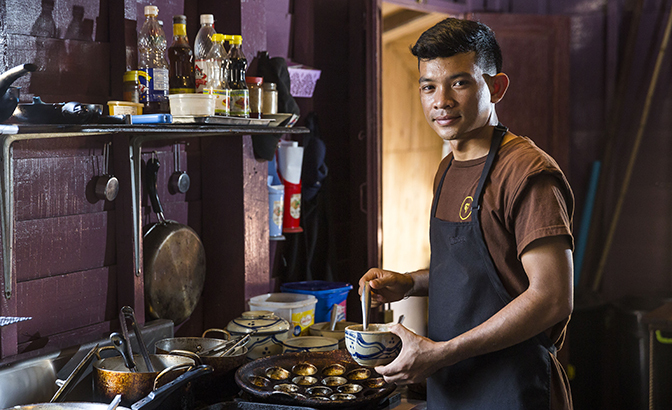 The day starts with a visit to Kep’s famous crab market, alongside the head chef of Knai Bang Chatt. We’ll choose live crab from bamboo baskets on the busy pier and get an insider’s perspective on Khmer coastal cuisine, then return to the lounge, where the chef will demonstrate traditional cooking techniques before our savory lunch. The afternoon is yours to explore. Hop on a mountain bike and hit the trails in the national park, explore the town, or simply relax by the pool. Today is all about relaxing on a remote, blissfully undeveloped island full of natural beauty. We’ll set sail for the sandy shores of Koh Tonsay, one of the best beaches in the area. Swim, read a book in the shade, lounge on the beach, and we’ll whip up a fresh seafood lunch right on the beach. Tonight is our last night together, and it’s a cause for a seriously joyful celebration. We’ll come together for a final taste of Cambodia as we share our favorite stories from the trip. Our final day together. Have no fears and no worries. 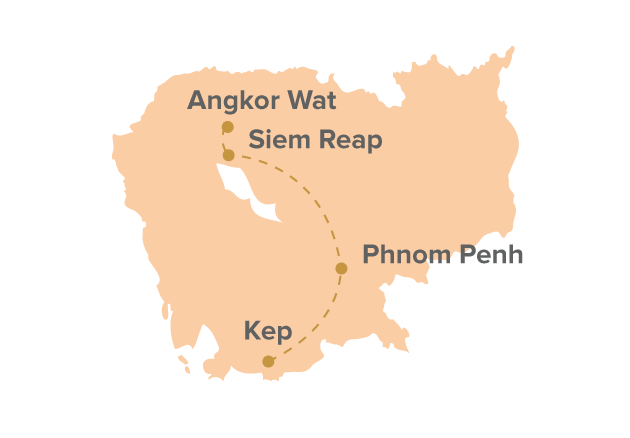 We’re loading up baggage and transporting you directly from Kep to Phnom Penh International Airport (or into Phnom Penh if you plan to extend your stay in Cambodia). Sleek modern design meets traditional Khmer architecture. 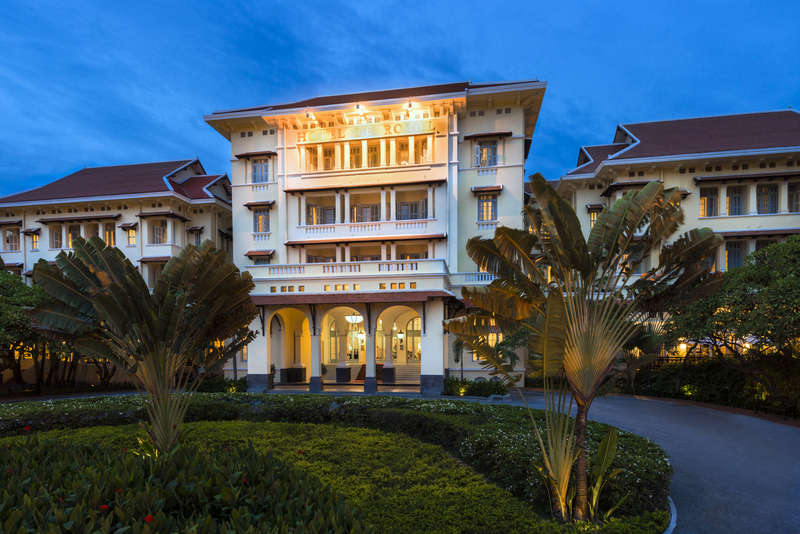 Enjoy the comfort and sophistication of our boutique hotels and resorts in Siem Reap, Phnom Penh and Kep. Our home for three nights in Siem Reap. Contemporary design with traditional Khmer highlights, with an ideal location near near art galleries and the central market. The swimming pool, lush gardens, a spa - Shinta Mani Shack is the perfect escape in the heart of the city. 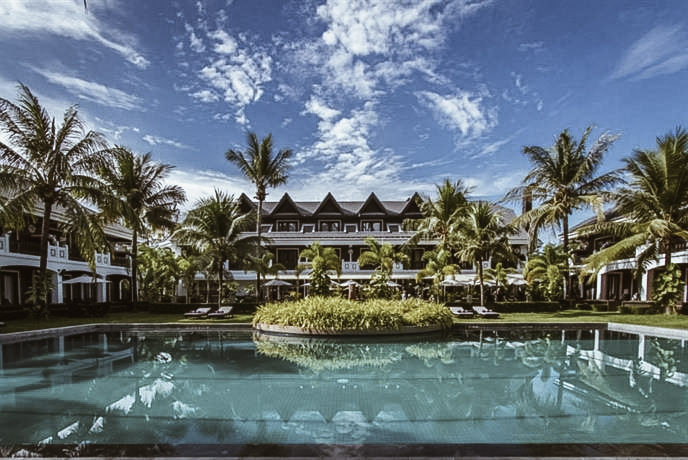 A French colonial masterpiece and an oasis for the well-traveled since 1929. Infused with history and style, it’s also centrally located and the ideal refuge with all the atmosphere and refined elegance you’d expect from a such an iconic grand hotel. Bauhaus goes tropical. This small boutique resort is a study in bold modern design with an ideal waterfront location framed by lush gardens, an infinity pool, and dreamy sunset views. Each room is uniquely designed by protégés of Vann Molyvann, a renowned Cambodian architect and pupil of Le Corbusier. We believe travel can be a force for good in the world. Here’s how you contribute to a brighter future for Cambodia traveling with Modern Adventure. of every dollar we earn is spent locally. 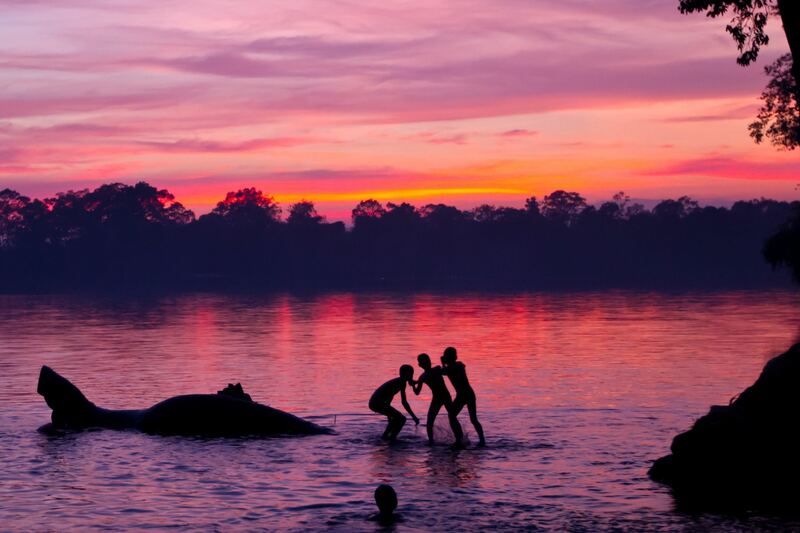 The cost of your trip has a direct positive impact on Cambodia. 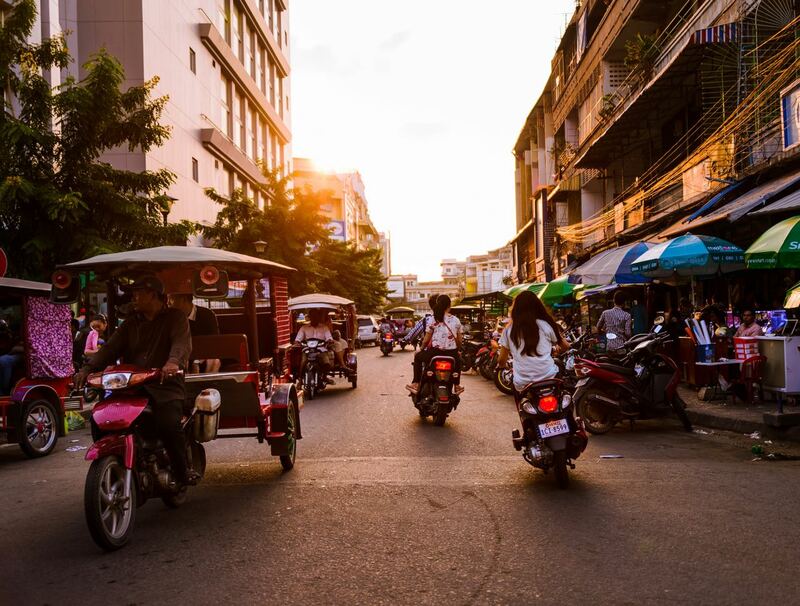 This trip directly supports four nonprofits in Cambodia: Marum (Siem Reap) and Romdeng (Phenom Phen), teaching hospitality skills to street youth; Phara Ponleu Slpak and Cambodia Living Arts, preserving Khmer culture. of all profits from this trip are donated to the Adventure Travel Conservation Fund, supporting sustainable tourism globally. Eight nights of four- and five-star hotel and resort lodgings; most meals; food tastings, cooking classes, and all guided activities as noted; private in-country group transportation from Siem Reap to Phnom Penh to Kep, and back to Phnom Penh; luggage transfers. Air transportation to/from Cambodia; airport transfers; one lunch and one dinner; alcoholic beverages (except at included wine tastings); entrance fees, meals, and all personal items during leisure time; travel insurance; excess baggage charges; gratuities and items of a personal nature; personal services in hotels (telephone, laundry, room service). We limit the group to no more than 18 fellow adventurers. You can expect to be joined by a diverse range of fellow travelers in terms of age, background and configuration – including solo travelers, couples and friends traveling together. Our experiences are about being fun and inclusive. Yes, there is a $1,500 supplement for solo travelers, to be paid after your booking is confirmed. 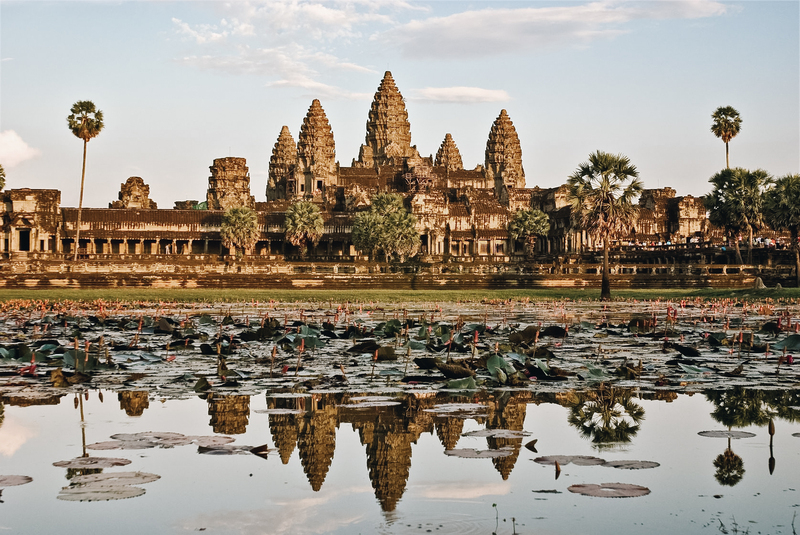 For U.S. citizens and citizens of most countries, your Cambodian tourist visa is obtainable upon arrival at the Siem Reap International Airport. You’ll need to bring a passport photo and $30 in cash. Visas are valid for up to one month stay in Cambodia.